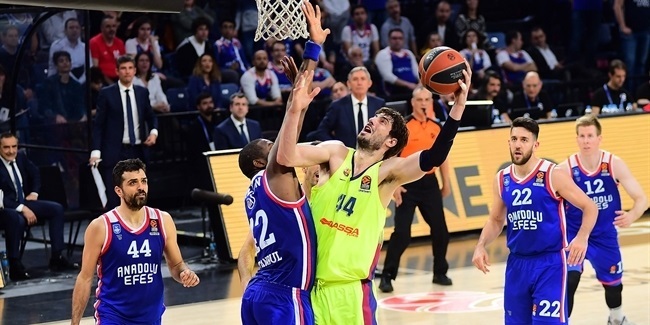 Anadolu Efes Istanbul team captain Dogus Balbay is entering his eighth season with the club and also his eighth in the Turkish Airlines EuroLeague. Standing at 1.85 meters tall, the veteran point guard might not be an imposing presence on the court, size-wise, but he has always been impeccably fit. Some coaches have gone as far as calling Balbay one of the fittest basketball players they have ever come across. Balbay's fitness is no accident; It is a result of a healthy lifestyle and diet, combined with a daily workout regime. "I always gave myself goals, and that is one of my goals, to be healthy and fit," Balbay explained. "Because if I want to be a professional, I have to look like a professional. And also, one of the most important things as a pro athlete is you have to take care of your body, and that is what I am trying to do." "If I don't work out, I don't feel good. Even on my off days, I feel like I have to do something." In Balbay's case, this was something he realized a very long time ago. His focus did not start last month or last year, but at the very start of his career, when he was just a teenager and got the opportunity to practice with his club's first team. He immediately got the sense of what it is like to share the basketball court with professional players, and got a picture of what he needed to do to stay with them. "When I was 15, I realized how hard I need to work to be among the guys who are professionals," Balbay recalled. "I started taking care of my body much better, sleep much better and eat much better. Because there was no other way I could compete with these guys if I didn't take care of my body and I didn't work hard. So, that's how it started, and I have been trying to keep up. Now I am 29, and it has been 14 years that I am really trying to take care of my body." Balbay has three pillars he likes to stick to: Eat well. Sleep well. And work out. "If I don't work out, I don't feel good. Even on my off days, I feel like I have to do something. Even at home, watching a movie, I feel like I have to do something because each time I take a day off and don't do something, I feel like I wasted that time." As harsh and strict as it seems, his workouts do not eat up his whole day. "First of all, what I am trying to do is not to build muscles, but to protect what I have," Balbay explained. 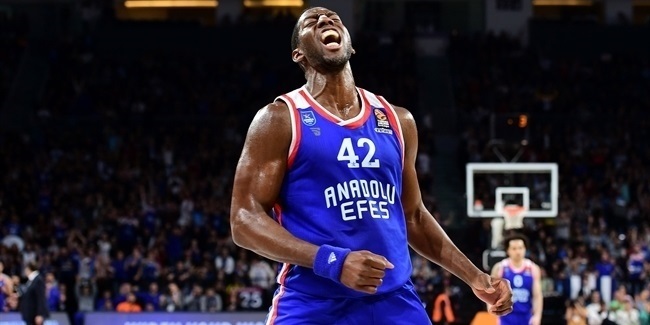 "Because we have a really busy schedule with the EuroLeague and the Turkish domestic league, so it is really easy to lose track if you don't sleep well, if you don't eat well, if you don't work out. So what I try to is protect my body, and keep what I have." "Of course, you try to build on top of it muscle-wise, but during my workouts I really don't go crazy. I go slow and easy and try to do it every day. If I work on my legs today, tomorrow I will try to focus on my abs or my back. So, in small portions every day I do that." Balbay also practices yoga with his wife Erica, who is a certified yoga instructor. “My wife and I, we fit together well," Dogus laughed. "We do yoga together. That is also a great workout for me, to maintain my muscles and sometimes clear my mind. And it is also good for stretching." Balbay said that Erica has made a big impact on his life and one of the important things they also do together is trying toa eat healthy. Dogus says it starts with breakfast, which he never skips. Then, sometimes during the day they make themselves protein shakes, vegetable shakes or green smoothies. Between practices, he might eat a snack, and in the evening after the practice, sometimes he will eat read meat, sometimes fish. "Before I might have eaten five baklavas in a sitting; now I eat one. That's the difference." "I try to divide it into different days, but I don't have a chart. Whatever I feel like it, I do it. But I try to do it the right way," he said. While the roots of Balbay's workout regimes trace to his early career and practices while he was with Fenerbahce Istanbul back in 2004, his determination to eat healthier food developed during the four years he was playing college basketball at the University of Texas in the United States. “I was in Austin, Texas, which prides itself for being a weird city. The slogan was “keep Austin weird”. Part of it, I guess, was that even back in those days we already had shakes, smoothies and green juices. It was the time before all the social media, which now spreads everything out to the world fast. That is when I started drinking those, and also started eating all the vegetables, from asparagus and broccoli, to artichokes and avocados. I read lots of books about the bad influence of fast food and I started to change my diet. That is how I started. Going to the States made me realize all of that a little better, and I started trying to eliminate bad stuff from my diet as much as I could, and it became a part of my life." Balbay stressed, however, that he does not stay away from burgers and pizza completely. "Sometimes I do eat them because your body needs that too, and you need to surprise your body. If I eat really healthy for two or three days, the next day I might go eat a burger or French fries." 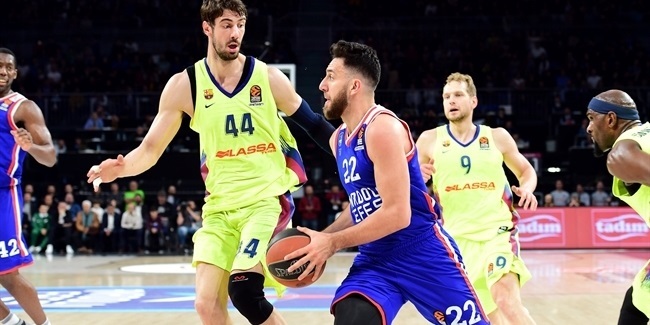 The Efes point guard will explain that it is not a big deal to sometimes eat “bad food”, or a baklava, which is only "the best dessert in Turkey." The point is not to lose track, and to know the limits. "Before I might have eaten five baklavas in a sitting; now I eat one. That's the difference. You control your appetite. I realized that is the most important thing." Balbay hopes the combination of it all can eventually also help him extend his career. Coming early to practices to do extra work on his body, taking care of his knees, his back and his abs, will help him be healthy and stay away from injuries. The key is having discipline and work ethic, and one other thing he never lacked was motivation. For Balbay, it comes from within. "I am not doing this for appearances or to look nice. The most important thing as an athlete is to respect yourself and respect your body. When you get on the court, you cannot look chubby and out of shape. So, I take care of my body and stay in shape out of respect for myself. " And even though his lifestyle was never about satisfying others, Balbay realizes there are many kids that look up to him when he wears that jersey on game days, and maybe, along the way, he could help change someone else's habits, too. "I know [as a basketball player] people follow you and they want to be like you. I am trying to be a role model, so the kids, if they want to be like me, maybe it would be good for them to learn to stay healthy and eat healthy."